Hunslet 0-4-0 2145 is pictured in the company of ex an ex GWR autocoach at Parkend, on the embryonic Dean Forest Railway, on 18 August 1978. 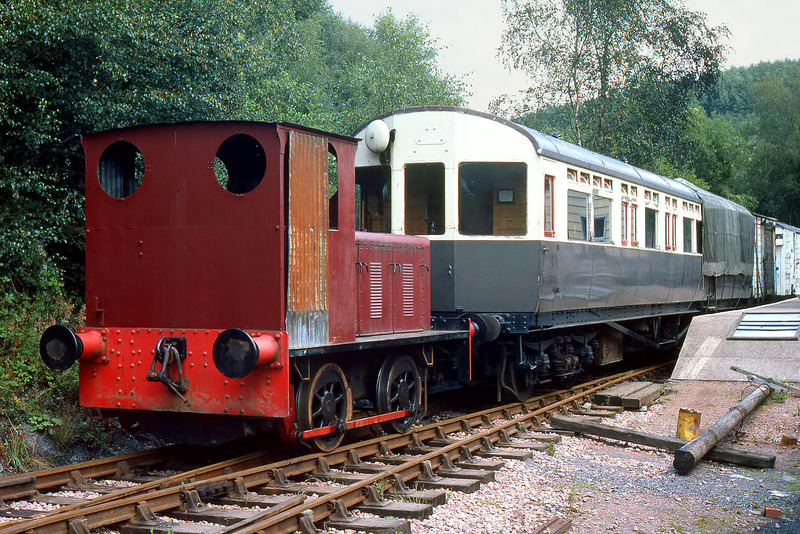 This loco was built in 1940, and after a career that included working for Standard Telephone & Cables, Newport, it entered preservation at the Dean Forest Railway in the early 1970s. Already by 1978 it appears to be out of use, judging by the rather permanent looking corrugated iron 'door'. Latterly it was dumped at the end of a siding at Lydney, becoming progressively more overgrown. It has since been restored once more, repainted green, and moved to the Tanat Valley Railway.